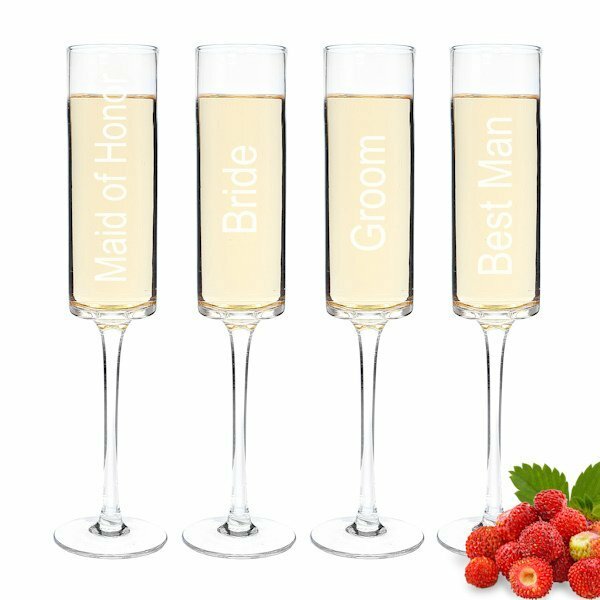 These contemporary styled champagne flutes are a perfect way to toast the night away at your wedding! Their sleek lines make them an ideal match for any decor as well as a timeless keepsake to enjoy for years to come. 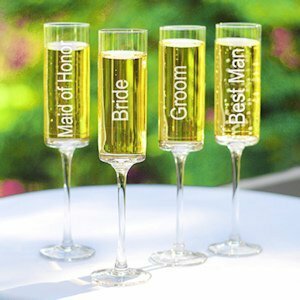 The set of 4 glasses are custom engraved with Bride, Groom, Maid of Honor and Best Man. Measure 10.5 in. H w/ a 2.5 in. diameter. Hold up to 8 oz. Dishwasher safe. Please Note: With hand blown glass, expect minor bubbles and swirls that are inherent to hand-blown glass. Variations will occur on styles due to their hand-crafted nature.